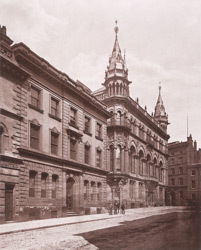 "The Reform Club, at the top of King-street, is a...structure of Gothic character, with an admixture of Italian details; the architects being Messrs. Edward Salomons & J. P. Jones, of Manchester and London. The principal front is of ashlar-work, with columns in polished red and grey granite. Each angle of the building is corbelled out so as to form a projecting oriel, which adds materially to the general effect. The hall and anti-hall are groined, the walls are decorated with terra-cotta, and relieved with marble columns, and the staircases are of oak, with carved balusters, inlaid with various kinds of wood. The dining-room, which canopies the greater portion of the first floor, is a well-proportioned apartment, 80 feet long and 32 feet in width, with a panelled oak and pitch-pine ceiling and doors and dado of carved oak. The club was opened on the 19th October, 1871."